THE book on devotion to the Sacred Heart! Commissioned by Our Lord Himself through St. Margaret Mary and received, through her, His endorsement. Responsible for the early, rapid spread of the Sacred Heart devotion. Contains the Saint's life, her prayers to the Sacred Heart, the Sacred Heart Promises (far more than the famous "12 Promises"), and much, much more! Great! By Fr. Louis Verheylezoon, S.J. This might well be called "the complete book of devotion to the Sacred Heart." Covers all aspects: First Fridays, 12 Promises of the Sacred Heart, St. Margaret Mary, St. Claude la Columbiere, her confessor. Gives the nature of the devotion; its object, purpose, and the method of practicing it; the motives for doing so, and Sacred Heart associations. Absorbing, thorough, and easy to read. By Fr. Peter J. Arnoudt, S.J. Recommended to us as even better than The Imitation of Christ, and we think it is! Written for everyone, and everyone should own it. In this book Jesus is speaking to the reader--through the author, of course--in short, easy-to-understand chapters that are filled with wisdom. Thereafter the student of the spiritual life--representing ourselves--speaks to Jesus. Renders a unique and powerful effect upon the soul! The story for children ten and up of the revelations of the Sacred Heart of Jesus to a holy French nun, including the Great First Friday Promise, her painful childhood, troubles in the convent, St. Claude, the apparitions and her many penances. This is considered to be the best biography of The Saint of the Sacred Heart Devotion. The whole story of the revelations, plus the definitive story of her life. Portrays St. Margaret Mary as a redoubtable soul, ready to give all for Jesus. And what an example she is! 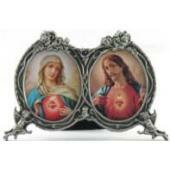 It is largely due to St. Margaret Mary that we know what we do about the Sacred Heart of Jesus. A brief summary of her life and mission. Includes her revelations about the Sacred Heart and the priesthood, showing how Our Lord desired to transform the world by love--in particular, by the superabundant supernatural love His priests should show men. Also contains a description of the "Priests' Universal Union of the Friends of the Sacred Heart," which she founded, an outline of their duties, and a selection from her writings--which are suffused with simplicity, directness and that holy penetration common to all the Saints. This short biography of Josefa Maria Menendez, coadjutrix sister of the Society of the Sacred Heart, together with the notes she wrote under obedience to her Superiors, are extracts from the life and complete notes published under the title of The Way of Divine Love. They reiterate Our Lord's consuming desire to attract souls to the merciful love of His Sacred Heart, an appeal which began in the Gospel and which Our Lord has continued up to the present time to renew through those He chooses for this purpose. 20th-c. revelations of the Sacred Heart of Jesus to a young Spanish nun. Perhaps TAN's most inspiring and influential book. Makes lasting devotees. In print since 1949. "Little girl, I’m coming with you, I’m from Corps too". At these words, the natural evil in me soon showed itself, and taking a few steps back, I told him: "I don’t want anybody around. I want to be alone." But the boy followed me, saying: "Go on, let me stay with you. My Master told me to come and watch over my cows together with yours. I’m from Corps." A moment later, I looked behind me, and there I found Maximin sitting close to me. Straightway he says to me: "Keep me with you. I’ll be very good."